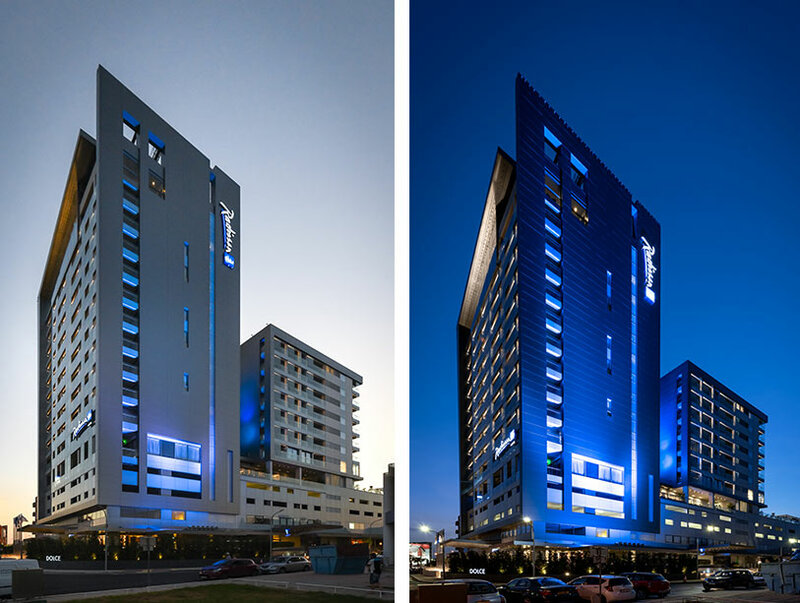 illumination Physics is proud to present a façade lighting project in Larnaca, Cyprus. The Radisson Blu Hotel has been open for business since November 2018. One of the new breeds of hospitality venues in the Cypriot market, this Radisson is actually the first business hotel set in an evolving economy. 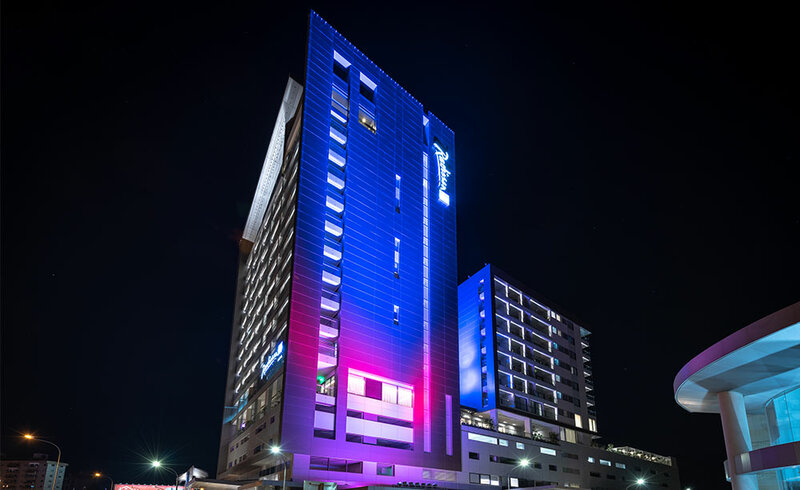 The Radisson Blu was to be illuminated externally with dynamic lighting by illumination Physics to draw attention, as well as provide a sense of arrival critical to the marketing of the property. Therein lay the genesis of the lighting design that was conceived of by Cypriot lighting designers Archtube. The dimensions of the building are modest; it does not exceed 18-storeys in height for the main tower and 4 less for the secondary tower. This meant that even the tallest façades would fall into the range of two new illumination Physics light fixtures – the IP Circular Wash Quattro (a 270-watt RGBW wash light) and the IP Rectangular Wash Mono (a 220-watt RGBW wash light). The new powerful circular wash light uses heat pipe technology to cool the LEDs and represents a significant step forward for a powerful light fixture in such a compact and attractive package. Where appropriate rather than using a powerful circular fixture, we choose rectangular fixtures producing a rectangular beam to add to the overall illumination. Extensive modelling of the lighting was done in the virtual world of Dialux. In illumination Physics nomenclature, the descriptions are literal: ‘Circular’ or ‘Rectangular’ defines the shape; ‘Quattro’ states that a 4-in-1 LED package is employed; ‘Mono’ refers to single LEDs. Martin Opolka, illumination Physics’ European manager, and illumination Physics partner and Technical Director, Peter Kemp, attended the on-site testing and commissioning, accompanied by illumination Physics’ own programmer who commissioned and programmed the control system. 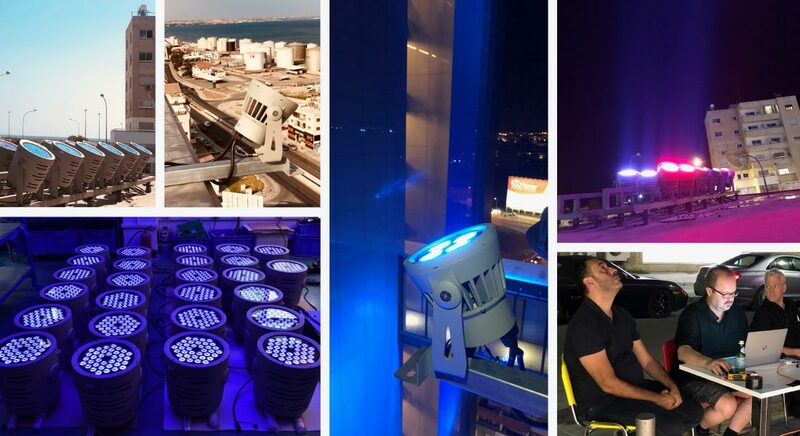 Our work also included testing and the rectification of all data connections, including the aiming/focusing of all lights and the installation and setup of the complete control system. Prior to the system being installed, an illumination Physics representative attended the site to instruct the installers on the installation of the data network and other requirements for our systems. This level of care is typical of illumination Physics’ inclusive project management in which we can guarantee a perfect outcome by controlling all aspects of the work. The lighting effect exceeds the promise of the initial design and the ambition and intent of the lighting designer and their client. The value is such that plans have already begun for the illumination of the second Cypriot hotel of the same brand, currently under construction.